For the longest time, I have always associated Peranakan food with pork because of how people in our food-crazy nation always wax lyrical about dishes like babi pongteh, nyonya babi asam and kuih chang babi. 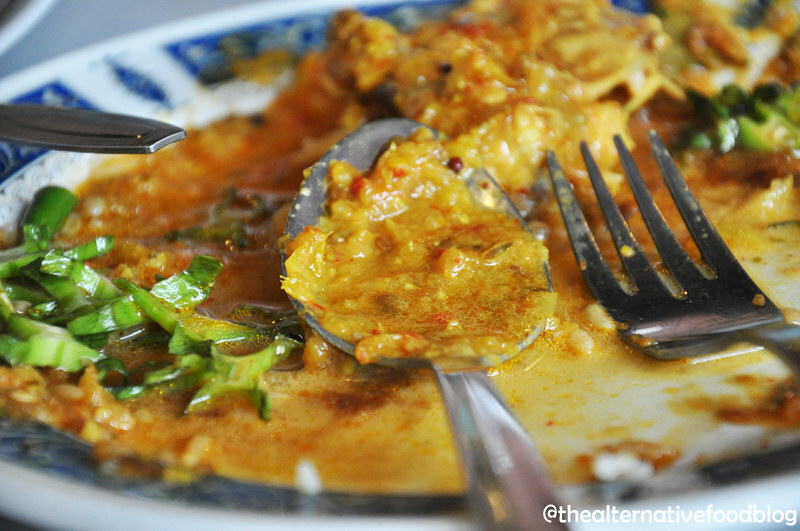 Even in conversation with Peranakans themselves, the dishes they always get excited about are those with pork in it. 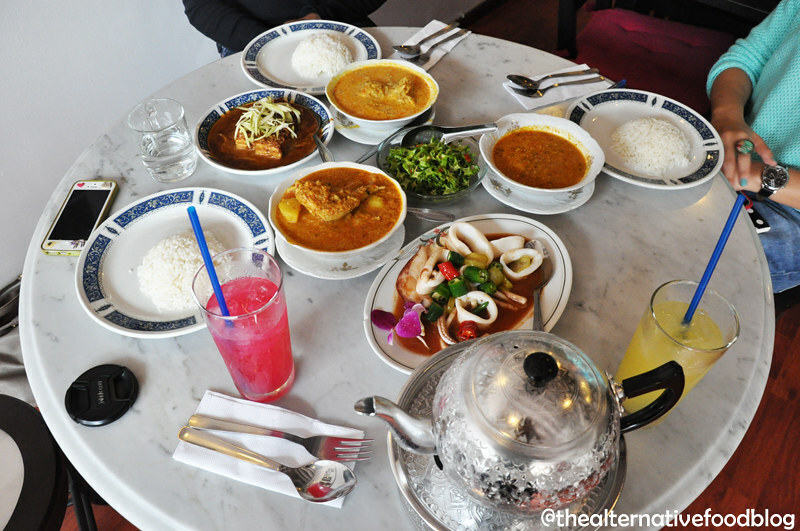 Given the excitement surrounding the pork dishes, I had never bothered to search for halal Peranakan food. Furthermore, given my (little) knowledge of Peranakan food, if on the off chance I did manage to find a halal Peranakan eatery, I worried about the lack of vegetarian options, if any at all, for Kit. This was of course, until I had a conversation with my cousin, who pointed me in the direction of Casa Bom Vento, an authentic halal-certified Eurasian-Peranakan restaurant right here in Singapore. Now that my first worry about Peranakan food (not being halal) was out of the way, I called the restaurant to find out about their vegetarian options. I was put through to the chef himself, Chef Lionel Chee, who asked me what sort of vegetarian Kit was and if she took garlic, onions and eggs. He then assured me that given Kit’s type of vegetarianism, he wouldn’t have a problem preparing dishes for her. Satisfied with his answer, Kit and I made plans for lunch at Casa Bom Vento with our special guest, my cousin. 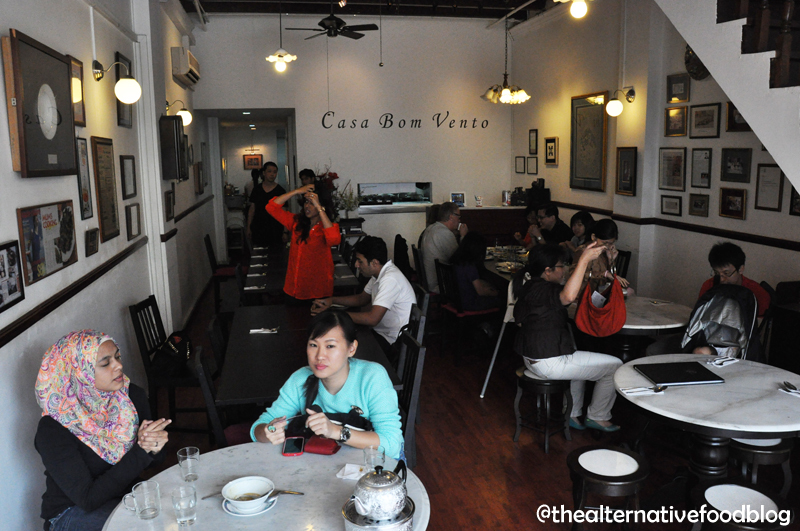 Casa Bom Vento is very aptly located in Joo Chiat, an area with very heavy Peranakan influence. 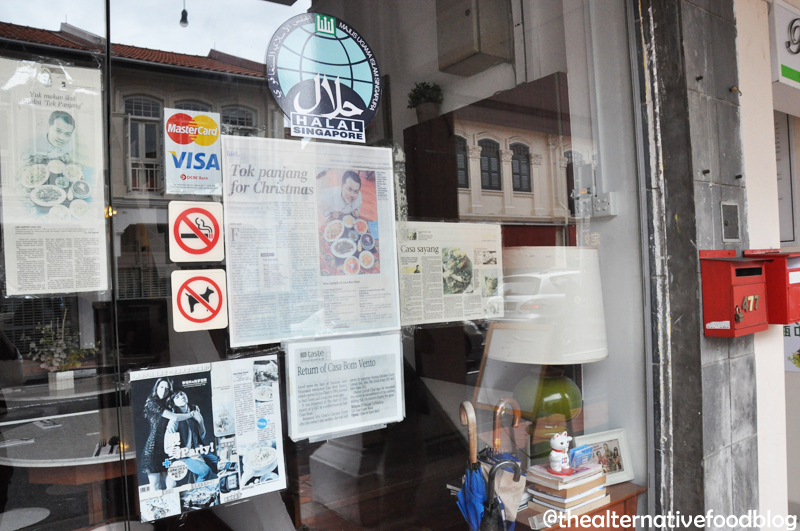 Joo Chiat has been very closely linked with Peranakans since the early 20th century when many families of Peranakan descent set up home there and even now, the Peranakan influence in terms of food and architecture around the area still lingers. Kit and I met my cousin for lunch at about 12.30pm on a Saturday afternoon and found there were already a few people having their lunch. Since my cousin arrived before us, she grabbed us a table and some menus which we were quick to attack once we sat down at the table. At first glance, the menu is definitely not vegetarian-friendly with only a handful of purely vegetarian dishes (that still contain garlic and onions). After giving us ample time to select our dishes, one of the staff came over to take our order. We had intended to order some vegetarian dishes, some meat dishes and a vegetarian curry to share so we inquired about the possibility of turning their Eurasian Debal’s Curry into a vegetarian one but we were told by the staff that if we wanted our dishes to be vegetarian, we should have called prior to our arrival to request for them to prepare the dishes. Admittedly, I was a little peeved because I had called them two days before to check on this exact issue and no one had mentioned this to me. Thankfully, Kit wasn’t too upset and decided to order the vegetable dishes and some sayur lodeh instead. So instead of our original plan, we decided to order different dishes instead so that we could share more vegetarian options with Kit. The three of us opted to share the Deep Fried Tofu with Chef Sauce Raw Mango (SGD $7.50), Spicy Kacang Botol Salad (SGD $7.50) and the Sayur Lodeh (SGD $9) while my cousin and I shared the Sambal Asam Sotong with Belimbeng (SGD $16) and Mrs Chee’s Chicken Curry Lemak (SGD $12). We also ordered a plate of white rice each for ourselves. 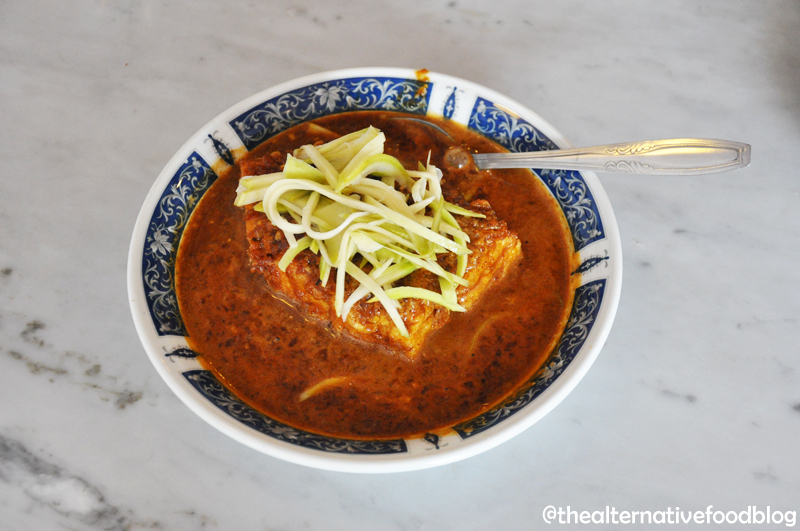 While waiting for our order to arrive, I took a look around the restaurant and was immediately struck by how the owners tried to preserve the traditional feel of a Peranakan home within the confines of the restaurant. 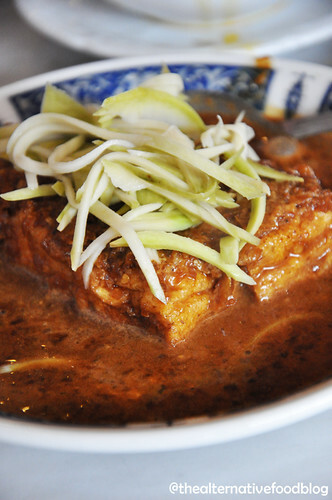 With cuisines such as that of the Peranakans, there is more to the dining experience than just the taste of the food. Rather, it is the little things such as the wooden chairs that were newly varnished, marbled tables and wood floorings that take you back to an older Singapore and an even older Peranakan culture. The food is prepared upon order and served hot and fresh from the stove but thankfully, we didn’t have to wait too long for our dishes to be served. One thing I found myself doing while trying the different dishes was trying to link it back to Malay dishes that I already knew existed and it wasn’t so difficult to do because after all, Peranakan cuisine does have its roots in not just the Chinese cultures and traditions but also the Malay culture, a result of Chinese immigrant traders marrying local Malay women or Batak women from Sumatra. When the Sambal Asam Sotong with Belimbeng (SGD $16) was placed before us, we were awed by the beautiful dish that was put in front of us. Though the name sambal seems to put forth images of a red sauce, this dish however was far from it. 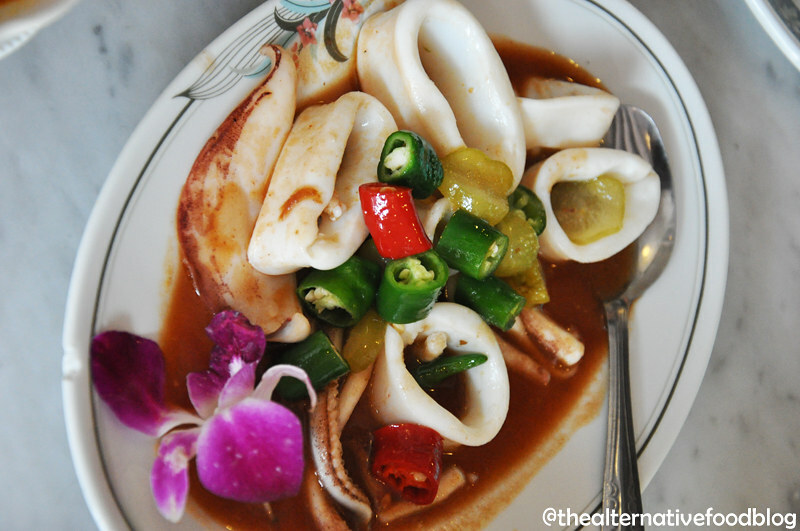 The white pieces of sotong swam in a thick brown sauce which is made up primarily of belimbeng, chilli paste and tamarind. There was even a sole orchid flower floating in the sauce, which on its own, is extremely sweet but combined with the tamarind and chilli as well as the freshness of the squid and the white rice, it was a pleasure to devour. I am generally a fussy squid eater because I worry about the freshness of the squid yes, but theirs was fresh, well-cleaned and well-prepared. 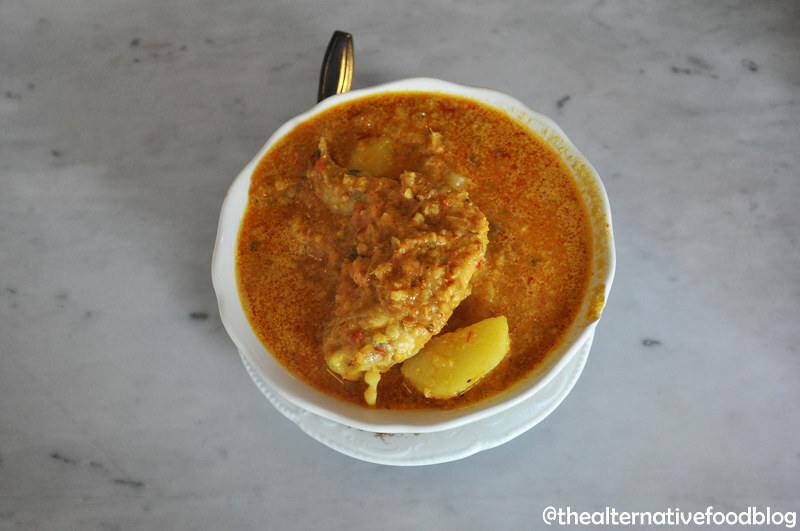 We decided we would also try Mrs Chee’s Chicken Curry Lemak (SGD $12). Prior to my visit here, I read numerous reviews and in every review, there was either a mention of Mrs Chee’s lemak or ayam buah keluak. The dish is named such as tribute to the late Mrs Chee, Chef Lionel Chee’s mother, whose recipes these are. 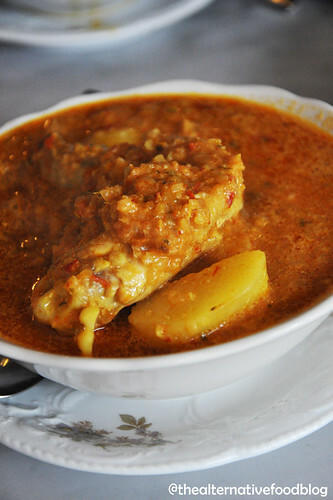 Lemak in the Malay sense of the word refers to a very rich, coconut-based broth that is thick and very, very sinful. To my surprise, when I tasted this Eurasian-Peranakan version of the dish, I found it to be extremely light and chunky. My curiosity was piqued when I lifted up my spoon and noticed bits of onion chunks in the broth and whatever questions I had were answered almost instantly when Chef Chee came to our table during our lunch to check on how we were enjoying our food. He shared with us that at Casa Bom Vento they don’t use curry powder or artificial flavourings. Rather, to get the flavour in the dishes, various ingredients are blended together to form a paste that helps to create the flavour in the dish. 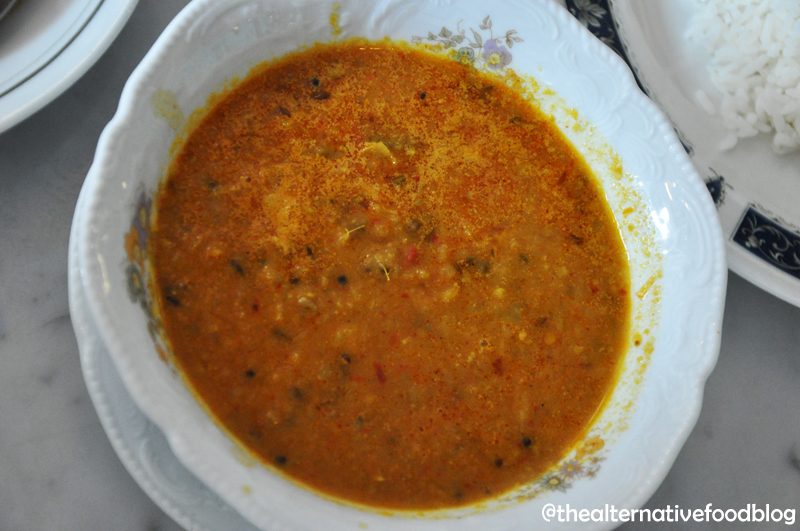 For instance, he shared with us that instead of using thickener for the curry lemak, buah keluak is used and onions are blended into the paste to create sweetness to the dish. In my personal opinion, this is what sets their lemak apart from its counterparts because instead of using coconut cream or thickeners, the clever use of the buah keluak results in a lighter dish that packs the same punch. The dish is not too spicy so if you have a low tolerance level for spice, this would sit well with you and the generous serving of fresh chicken in the dish is definitely worth the SGD $12 spent. If I had to pick my favourite of the three vegetable dishes we ordered, I wouldn’t be able to because I thoroughly enjoyed every single dish and each one is so distinctively different from the other. The Deep Fried Tofu with Chef Sauce Raw Mango (SGD $7.50) reminded me a lot of the Indonesian tahu telor except that this dish had no egg in it and instead of the cucumber that is usually added onto the latter, this is topped with raw green mango. The tofu is deep fried to golden perfection and doused in a thick black sweet sauce which contains lemongrass and, we suspect, some coconut as well. The sweetness of the sauce was complemented by the freshness and tang of the raw green mango which made the dish a delicious one. We were in luck because during our visit, the Spicy Kacang Botol Salad (SGD $7.50) was in season. Apparently, this dish is not always available so if you’re travelling down specifically for it, you may want to call and check first. 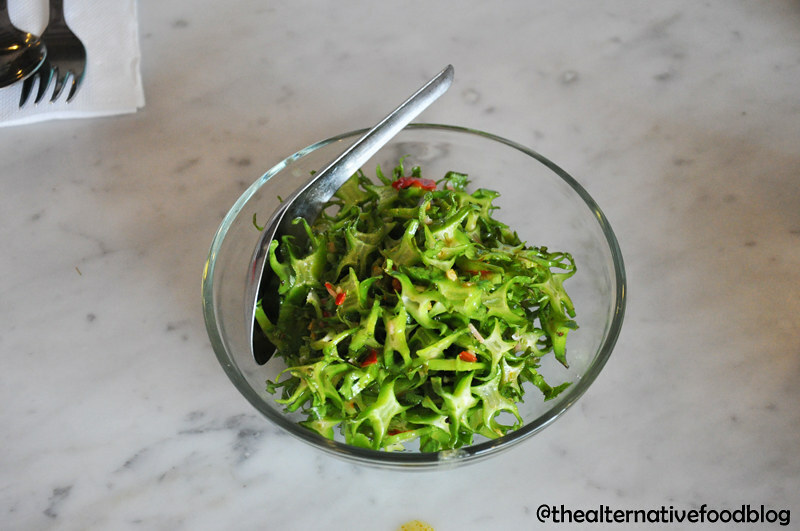 The crunchy kacang botol salad or winged bean salad is very much like a raw salad that is tossed in some lemon grass, fresh chilli and lemon juice and goes so well with all the other dishes. If you’re hoping for bags of flavour with this dish, you’ll be sorely disappointed but it is the simplicity of the flavours here which made it such a hit with us. Do note that you have to specify you are vegetarian when you order this dish even though the ingredients stated in the menu do not list any meat or seafood. Kit also ordered the Sayur Lodeh (SGD $9) because she needed some gravy to go with her dishes. 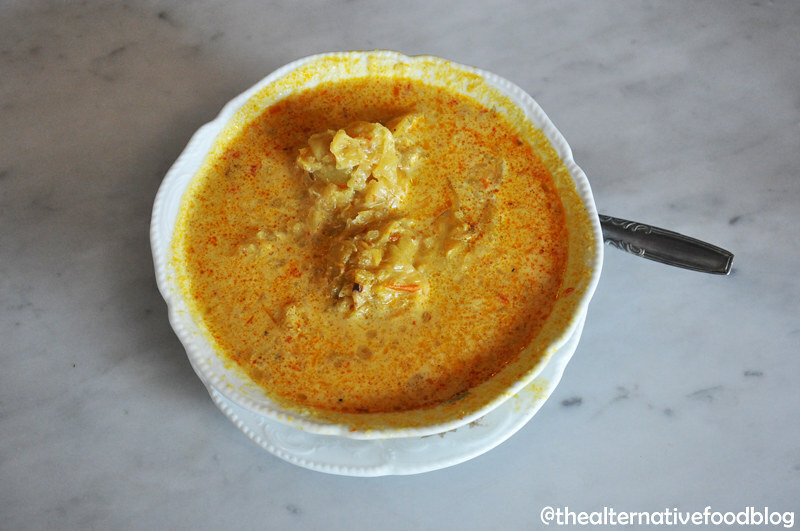 As all three of us tried the lodeh, we unanimously agreed that it tasted so much like the traditional sayur lodeh which is made with coconut cream and desiccated coconut but only this was much lighter, just like the curry lemak was. Again, we realised it must be the way in which the paste is made – from the ingredients themselves and not just powders and pastes. In place of coconut cream, it is possible that fresh coconut milk is used instead making it less creamy but still just as flavourful. Because of our little incident with trying to order vegetarian versions of their dishes, Chef Chee knew that we had a vegetarian amongst us and came out to serve us some complimentary vegetarian fish curry which quickly became the crowd pleaser at our table. It is still a mystery how the vegetarian fish curry that had no fish in it at all tasted exactly as it should be right down to the texture and fragrance of the dish. Similar to the curry lemak and the lodeh, this fish curry was equally chunky with onions and other spices but tasted very good. At the end of a six-dish meal, we realised that we weren’t feeling stuffed at all and the three of us concluded that it was definitely the fact that the dishes were all very light. It seemed to contradict all that I had heard and read about Peranakan food but despite the lightness of it all, it didn’t seem like the taste was compromised at all. We washed down our meals with lime juice (SGD $3.00) and rose jelly drink with lime juice (SGD $3.50) which were both light and refreshing. Kit’s lime juice had a slight bitter aftertaste but my rose jelly drink sat well with me. As testament to how light the entire meal was, we ordered a bowl of chendol (SGD 3.00) to try for ourselves. My cousin had raved about the chendol so we knew we had to try it to believe it. Truth be told, the chendol looks simple and ordinary as any chendol would look like but it is hands down, the best chendol I’ve ever tasted in my life. 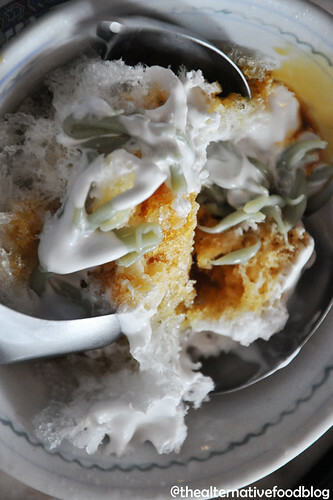 It is a four ingredient chendol – gula melaka syrup, ice shavings, rice flour jelly with pandan colouring and coconut cream, but in itself, it is amazing. 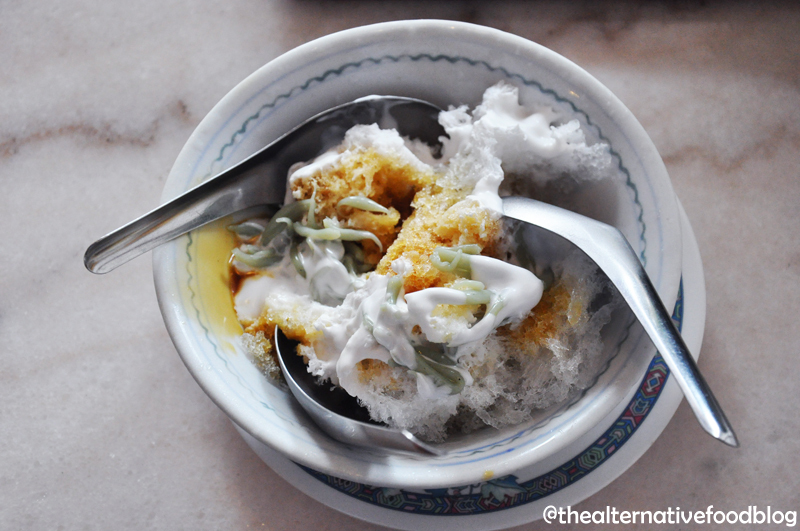 The sweetness of the gula melaka together with the slight saltiness of the coconut cream marries so well with the ice shavings. The rice flour jelly that is handmade (as opposed to the mass produced ones) is the little surprise at the bottom of the bowl. I could have sat there and finished the entire dish if I didn’t have to share it with Kit. It is undoubtedly the best thing on their menu and I would travel all the way back to Joo Chiat just to get my hands on their chendol again. My first foray into the world of Peranakan food was definitely a pleasant and interesting one and I can’t wait to head back to try out more of their dishes. 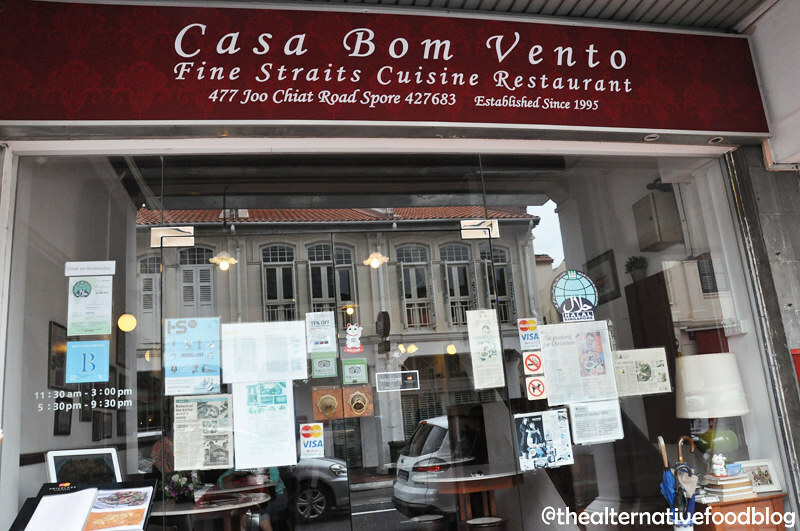 I don’t think there is any other Peranakan eatery that serves halal food at this point in time so until then, to Casa Bom Vento I shall go. Even as I type this review, all I can think of is …. that chendol. Vegetarian Options: Vegetarians are advised to call the restaurant at least a day in advance to explain dietary requirements so advance preparation can be done for dishes. Special Promotions: 15% off with use of OCBC cards.